As some of you may already know I make my living as a corporate pilot. I began my career as a flight instructor and I have taught hundreds of pilots everything from spin recovery and aerobatics all the way to multi engine instrument training. As you can imagine I have had many emergencies over the last twenty years in aviation, but whether I am the student or the instructor (and regardless of whether the emergency is real or simulated), my first instinct is always the same: Fly The Plane First. There are very few emergencies that will render the aircraft un-flyable, however there are thousands of pilot inputs that could auger you down into the core of the earth if you are not strategic and intentional with all of your decisions and flying inputs. “Fly the plane” simply means that we should concentrate on keeping the aircraft flying and make sure that we don’t let this emergency distract us from the most important thing that we are doing – flying. I have read too many NTSB reports where distracted pilots have flown into terrain or lost control because they were too distracted by some flashing lights that weren’t even critical to flight safety. Interestingly, this correlates very closely to competitive auto racing. My most common error personally and with my students is that we tend to get caught up in the excitement of this big race and we lose touch with the seconds that we lose when we are not strategic and intentional with every input. 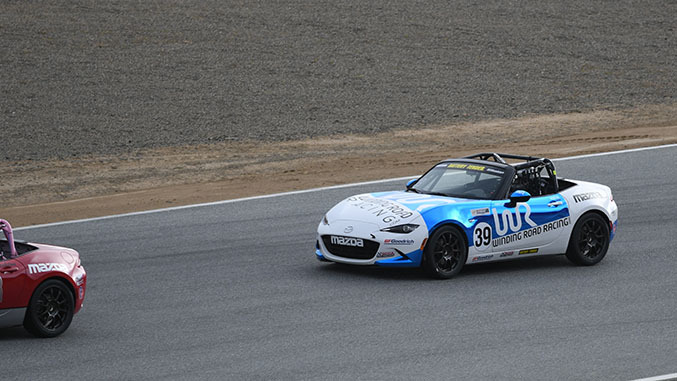 For example, during my first Battery Tender Global MX-5 Cup race presented by BFGoodrich Tires I found myself in this all too familiar situation in which I got distracted by the crazy driving all around me and I began to push my car deeper into every braking zone. Shortly after I adopted this super aggressive style I was essentially creating a series of emergencies with my false urgency and I began to make mistakes and took chances that were not strategically sound. 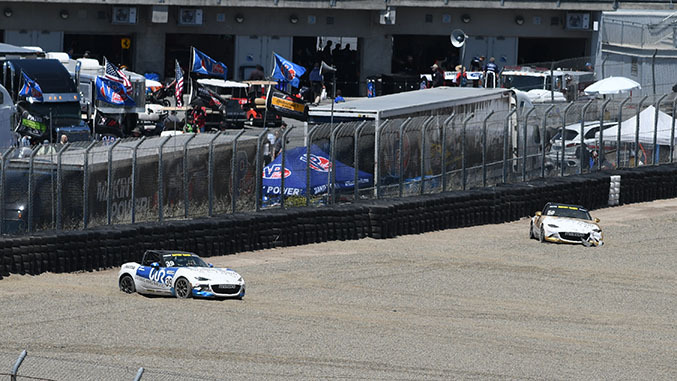 During Race 1 I started 18th and I had a great start that immediately launched me into the top 15, but those spots were quickly given back when I drove my car right off the exit of turn 10 on the first lap. I managed to maintain control and salvage the lap but this off-track excursion not only cost me nearly a second on this lap but several additional seconds during the next few laps as I would now have to pass these cars again over the next few laps. Despite this obvious wake up call, I ignored the warning signs and continued to drive the tires off my car for the next few laps, desperate to make passes in less than ideal places until I found myself in lap 10 with overheated tires. Yes, I had made some passes and now I am four or five spots ahead of my starting position, but at what cost to my total distance covered over this 45 minute race? I was driving the entire race with a hero or zero mentality and I did not realize that it was not serving me or aiding in my success. I have preached against this type of driving to my students and myself forever, yet here I was again, back in grade school. I eventually completed this race in a respectable 12th position, feeling exhausted and humbled by the talent around me. It was not until I began to review my data and video that I realized that I am living the same lesson again and again. Fly the Plane Dummy. Dear self: You are overdriving the car again and you are making passes that are slowing you and your competitors down and it is costing you positions. Oh geeez, really? Is it possible that after 20 years of racing I am still falling into this same old trap? So as I add up all of my mistakes I calculate once again that I could have finished deep into the top ten if I had been more strategic and less aggressive. But Race 2 is a new day and I am a new man with a new plan. In Race 2 I started 24th (my next article will be about qualifying strategies) and I was hell bent on making sure that I had some tires left for the last 20 minutes when everyone else’s pace would fall off drastically. 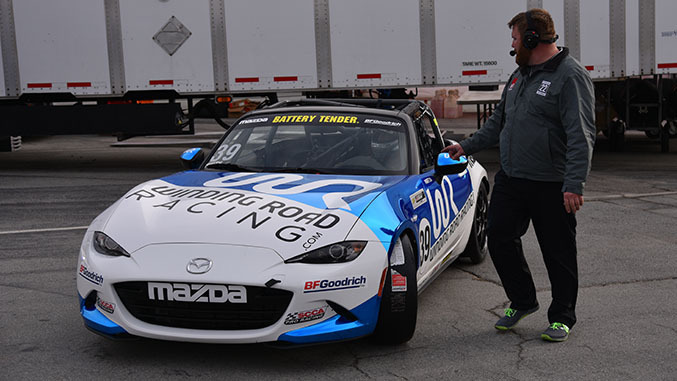 I found myself making smart passes in areas where I knew I would succeed on the first try and I was driving the car at 97% in order to keep tire tempuratures in the sweet spot during the course of the entire race. The first ten minutes was painful and it felt like I would never see the front of this 45 car field. However, around lap 7 or 8 I began to make ground on my competition and slowly started working through the field. I steered clear of drama, I ran fast consistent laps and I kept most of my wheels on the pavement most of the time. At the half way point I found myself already ten positions forward around 14th and it finally became obvious that our strategy was working – I may actually find my way to top ten. As the race progessed my competition continued to slow down and make mistakes, and I continued to run consistent fast laps. The next thing I know I am not only top ten but I am in position to pass for 7th position. I was so excited by this proposition that I had a big slide, over corrected and drove my beautiful Winding Road Team TFB MX-5 right into the sand trap on the last lap at turn 10, where I watched all of my new frienemies pass by to complete the race. I hope you weren’t expecting a happy ending. Yes it was a huge disappointment to myself, my friends and my amazing team, but the light at the end of this tunnel is that we proved the strategy and we are now sure that we have what it takes to run in the front of this very competitive field. It’s interesting how we always circle back to the basics. Our team owner Tom Martin likes to use the quote, “To finish first, you must first finish” and it really resonates true in your head as you are sitting stuck in the kitty litter waiting for the tow truck. Please watch the Watkins Glen Race from our live stream on May 14th and see if I can execute these strategies all the way to the podium.